Designed with children in mind, our containers are fun, colorful and most importantly, easy for children to open while at school. Keep your food fresh and safe from contamination with the bento box dividers / lunch containers. 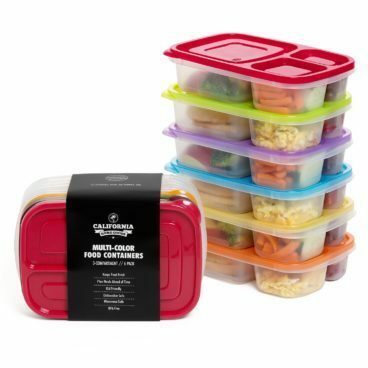 Each compartment container keeps food contained to prevent sogginess and keep food long term. Our kid friendly food containers are made from eco friendly, recycled & BPA Free polypropylene to ensure maximum durability and safety from harmful chemicals typically found in plastic food containers. Each bento box has 3 roomy compartments (8.7″ x 6.1″ x 2.1″) so that you can prep an endless variety of healthy meal combinations and options for your child. Fits in most lunch bags. If you’re ever unsatisfied with the performance of your food containers, we’ll give you your money back or offer you a replacement!